Brownies! | come blow bubbles! So, I don’t typically bake for a few reasons. One, I have a small kitchen and I’m lazy. Baking usually requires a lot of dishes and a lot of mess, which only gets compounded when you have to get creative with where you are putting these dishes. 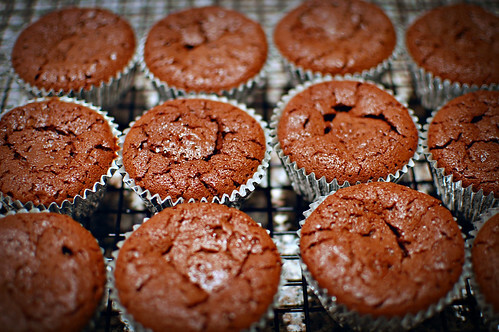 Two, I have no self control–once I bake something I want to eat it all. I’m the type of person that can avoid food temptations if I don’t have any. As soon as I have one bite, it’s all over–I can’t stop. Because I rarely bake, I also don’t have a lot of baking ingredients on hand which also discourages me from baking on a whim. Caroline over at Coeur de La posted on her facebook page that she was taking a study break to bake some brownies. For some reason, this made me remember the recipe that has been sitting on my fridge for almost a year that I have yet to attempt. I decided that I had to bake some brownies with my recipe from Le Pain Quotidien. They were soooo yummy–nice and gooey, rich but not too rich. I had a moment where I was very disturbed at the amount of butter that went into the brownies, but I quickly got over it when I tasted their chocolatey goodness. And now for the recipe…for those of you who are wondering how I got my little hands on this, it’s simple–they give out recipe cards with their bill and I happened to score the brownie recipe! Roughly chop the chocolate into pieces. Transfer to a medium-sized bowl and add the butter. Place the bowl over a saucepan of simmering water until the two ingredients have melted. Mix well and transfer to a large bowl and set aside. Preheat the oven to 325°. Sift the sugar and flour together, then stir into the chocolate. Add the eggs and mix well. Cover and let rest at room temperature for 30 minutes. The batter will thicken as it stands. 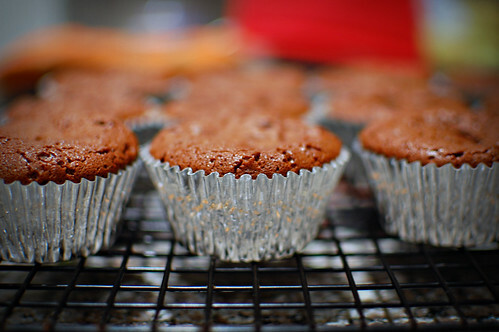 Line a muffin tin with cupcake papers. Spoon 1/4 cup of the batter into each paper-lined cup. Bake 30-35 minutes. The brownies will still be moist when done; they will puff up and fall slightly as they cool. These look amazing, and absolutely yummy!!! looking at these brownie photos just set me back weeks in my “operation: dessert reduction”…the sugar attacks will now continue! this post makes me want to a) try these and b) take pictures. might just have to do both soon.